Today, the SpaceX CRS-10 cargo resupply mission to the International Space Station (ISS) blasted off containing a critical piece of experimental electronics. Why is this big news? Because the experiment is controlled by an ARM-based VORAGO Technologies microcontroller. ARM technology is seeing increased momentum in the space industry, with NASA recently selecting the ARM Cortex-A53 processor for suppliers to build next-generation space electronics around. But the new experimental project – which is supported by Air Force Research Laboratory and NASA - marks the first time an ARM-based radiation-hardened microcontroller, designed specifically to withstand extreme conditions, has been deployed in space. RHEME (the Radiation Hardened Electronic Memory Experiment) is an important step in enabling next-generation space computing by tackling the issues faced in the incredibly challenging space environment, drawing on VORAGO’s expertise in radiation hardened chip design. In space, electronic memories are exposed to high-energy protons and radiation particles and when these particles strike a memory or other microcircuit they can alter the information stored in a memory bit. In some cases, multiple bits of memory can be changed. The corruption of this information can cause the electronics to malfunction and even jeopardize the mission. This is clearly a serious problem. Aiming to address this issue, RHEME will monitor the effect of particle strikes on memory over the course of a year. The experiment is monitored and controlled by a VORAGO ARM Cortex-M0 based microcontroller which uses the VORAGO HARDSIL® process, patented and proven to harden devices for radiation and extreme temperature environments. The results will enable the design and building of memories that can power-efficiently detect and correct errors and eliminate them in spacecraft electronics. Historically, electronics systems in space have been highly customized and based on Field Programmable Gate Arrays (FPGAs), designed and built for one-off rockets that were not intended for reuse, but as space exploration continues to evolve and the reuse of launch vehicles becomes possible, the electronics powering it need to become increasingly scalable, affordable and reliable. Fortunately, the standardized ARM architecture allows for this flexibility. 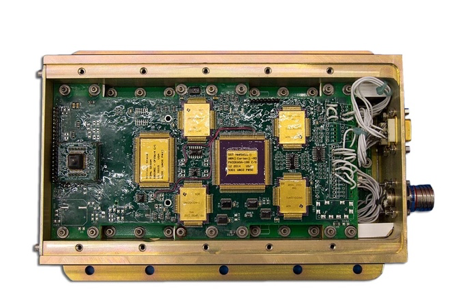 The experiment could change the way the space industry designs radiation hardened systems, accelerating design innovation for chips powering these applications and allowing more MCU-based electronics to be cost-effectively integrated in spacecraft for critical control and safety functions. These same radiation effects can also occur within equipment deployed a little closer to home on earth. For example, many ARM CPUs have been developed for use in functional safety applications with a ‘mission critical’ nature. In these applications, it is vital that these effects can be detected and mitigated, ensuring that the equipment under control does not harm people or the environment. These capabilities span many CPUs across the ARM portfolio, enabling designers to realize safety-certified systems meeting various industry standards, including ISO26262 and IEC61508, for applications that range from space exploration to ADAS systems in automotive to medical equipment. You can learn more about functional safety in this recent blog from one of our experts.